Custom Magnetic Memo Boards Personalized in Bulk. 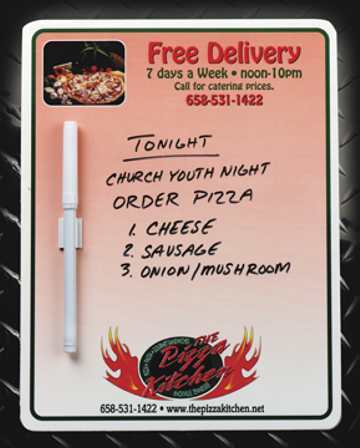 Erasable, Promotional, Inexpensive. Free Pens. Full Color Custom Imprint included. Budget Prices for USA, Canada. Bulk magnetic memo boards with pens and clips and with either your custom photo or the stock art of your choice. Contact us for the stock designs of our magnetic memo boards. Free artwork design. We will send you a proof for your approval before production. Budget Prices in USA and Canada for bulk magnetic memo boards. American clients pay no taxes. Setup Charge: $25.00 per order; No Setup Charge on re-orders.
. Dimensions: 8 1/2" X 11"
• Wet erasable pen and clip (packaged bulk).
. Material Thickness: 0.045" laminated board stock.
. 2 magnetic strips on the back that measure 2-7/8"x1". • Stock art upon request: contact us for many full color stock pictures: Things-to-Do, Kids, Money, Scales of Justice, Stethoscope, toothbrushes, pill bottle, house, daisies, light bulb, sunset, clouds, school house, flowers, classic car, dinner, snow tree, moon, barn, etc. ProductionTime: 5-7 days after art approval; Rush production is available: contact us.